Mahala Wester was born about 1819 somewhere in Georgia and died about 1860 somewhere in Florida. Dates for birth and death are estimated. She lived to be about 41 years old. The name 'Mahala' most like originates from the Muskogee Indian word for 'teacher' which is Mvhaya and pronounced muh-hah-yah. She married Wiley on 1/17/1832 in Decatur Co. GA. During the 1830 Census, Chas Wester and his family were living in Decatur GA. 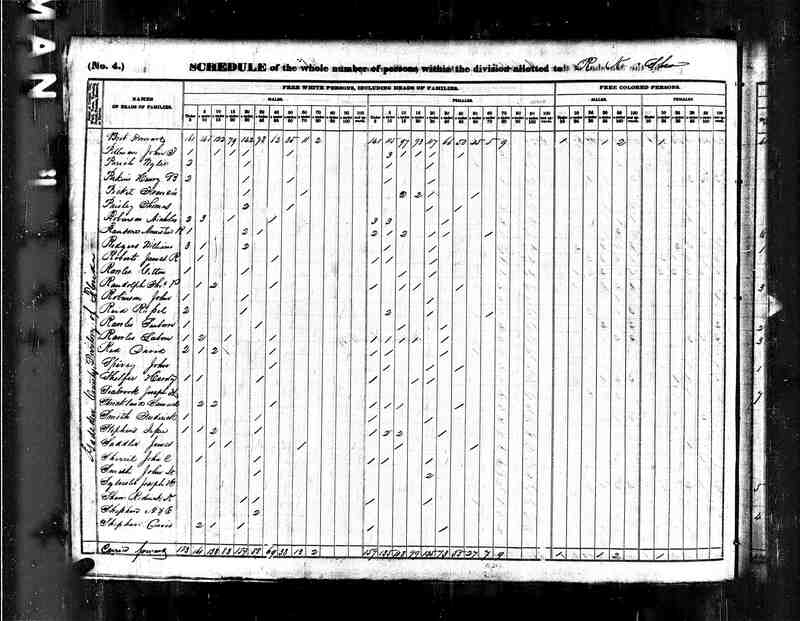 Most of the print has faded from the original census report and the size of his family is unknown. Elias is the other family named Wester living in Decatur GA at the same time. Other Wester families with daughters of the right age, living nearby during 1830 include one in Coweta Co. GA, Daniel Wester, and Edward P. Wester in Leon Co. FL. Mahala, her husband and her oldest child were born somewhere in Georgia. Around 1839 they moved to Northern Florida. Tax records indicate they lived in Gadsden County Florida between 1840 and 1856. They passed away sometime between 1856 and 1860. In the 1860 census the children are living with their sister, Sarah Parish Floyd. Wyatt Wesley Parish married Sarah Wester in 1826 in Telfair Co, GA. It is a possibility that Wyatt is Mahala's brother-n-law and Sarah is her sister. Wiley Marshall Parish born 1848. He married Georgiana Willis in 1869 in Liberty County, FL. Later he married Rachael Spears (born about 1883) in Calhoun Co. FL. Click here to see a copy of the marriage license. Click on any of the News, Events, or Discoveries buttons above to see historical things that happened during Mahala Wester's life. These are only some of the major events that affected the life and times of Mahala, her family, and friends. For example, Mahala is 1 years old when The Act of April 24, 1820 abolished the land purchase credit system, fixed the price of public lands at $1.25 per acre, and set the minimum purchase at 80 acres. After a person purchased land, a final certificate was issued by the land office and sent to Washington DC to be verified and signed by the President -- a time consuming process. Public lands were most typically available through US treaties with Indians who agreed to be removed from their homelands. 2 1821 Spain formally cedes Florida to the United States in 1821, according to terms of the Adams-On�s Treaty. Spanish colonists as well as settlers from the newly formed United States begin to pour into the new territory. Prior to this change, Florida was a wilderness sparsely dotted with settlements of native Indians, escaped/freed slaves and Spaniards. 4 1823 The Treaty of Moultrie Creek pushes the Seminole Indian towns into the interior of the Florida peninsula. 5 1824 Tallahassee is established at the capital of Florida because it is half-way between the two government centers in St. Augustine and Pensacola. The Legislative Council meets in November in a log house erected in the vicinity of today's capitol. 16 1835 The Second Seminole Indian War keeps the United States and Seminoles Indians fighting in North & Central Florida. 18 1837 NEWS HEADLINES: In October, Chief Osceola of the Seminole Indians is captured when he arrives for supposed truce negotiations at Fort Payton. He is imprisoned at St. Augustine, FL where he refuses to eat and attempts to escape several times. In December he is moved to a prison in SC where he dies on January 20, 1838. At the time of his death, Osceola was the most famous American Indian. 23 1842 Congress passes the Armed Occupation Act of 1842. It entitles persons willing and able to bear arms against the Indians and establish themselves in villages along the borders of Indian territory ownership of their land after 5 years. 26 1845 Florida becomes the 27th state to join the United States. William Moseley becomes the first governor and David Yulee the first senator. 31 1850 Florida's total population has grown to 87,445. This includes about 39,000 slaves and 1,000 free blacks. Indians were not counted. 36 1855 Third Seminole Indian War begins and war breaks out with most of the battles occurring in Central Florida. It ends three years later when Chief Billy Bowlegs and his band are forced to move from Florida. 1 1820 December 20 - Campbell and Randolph Counties formed. 2 1821 May 15 - Dooly, Fayette, Henry, Houston, Monroe and Newton Counties formed. 3 1822 December 9 - Bibb, Dekalb and Pike Counties formed. 4 1823 December 8 - Decatur County formed. 5 1824 December 15 - Upson and Ware Counties formed. 6 1825 Baker, Lowndes, Thomas, Butts and Taliaferro Counties formed. 7 1826 January 24 - Treaty of Washington abrogates Treaty of Indian Springs. The Creeks cede a smaller area and are allowed to remain on their lands until January 1, 1826. 8 1827 December 14, - Harris, Marion, Meriwether and Talbot. 11 1830 Cherokee, Heard, and Stewrt Counties are formed. 12 1831 Sumter County is formed. 13 1832 December 3 - Bartow, Cobb, Crawford, Floyd, Forsyth, Gilmer, Lumpkin, Murray, Paulding, and Union Counties formed. 14 1833 Walker County is formed. 17 1836 Seminoles massacre Major Francis L. Dade and his 103 man command. This starts the second Seminole War. February - Battle of Hitchity. March 27 - Colonel J.W. Fannin and his Georgian's executed by order of Santa Ana at Goliad on Palm Sunday. July - Battle of Brushy Creek. July 3 - Battle of Chickasawachee Swamp. July 27 - Battle of Echowanochaway Creek. 18 1837 Mcon and Dade Counties are formed. 31 1850 Gordon and Clinch Counties are formed. 32 1851 Clay, Howell, Polk, Spalding, and Whitfield Counties are formed. 33 1852 Taylor County formed. 34 1853 Catoosa, Pickens, Hart, Dougherty, Webster, Flton, and Worth Counties aare creaated. 35 1854 Fannin, Coffee, Chattahooche, Charlton, and Calhoun Counties formed. 37 1856 Haralson, Terrell, Berrien, Colquit, Miller, and Towns Counties formed. 38 1857 Dawson, Milton, Pierce, Glascock, Mitchell, Schley, White, and Wilcox Counties formed. 39 1858 Clayton, Quitman, Banks, Brooks, Johnson, and Echols Counties formed. Born about 1810 and died about 1860. Born somewhere in Georgia on July 1, 1838 and died in Liberty Co. FL, Florida on December 29, 1916. She was 78 years old. Born in Gadsden County, Florida about 1843 and died in Blountstown, Florida about 1878. He was about 35 years old. Born in Gadsden County, Florida on March 18, 1848 and died in Blountstown, Calhoun County, Florida on an unknown day in August 1920. He was 72 years old. 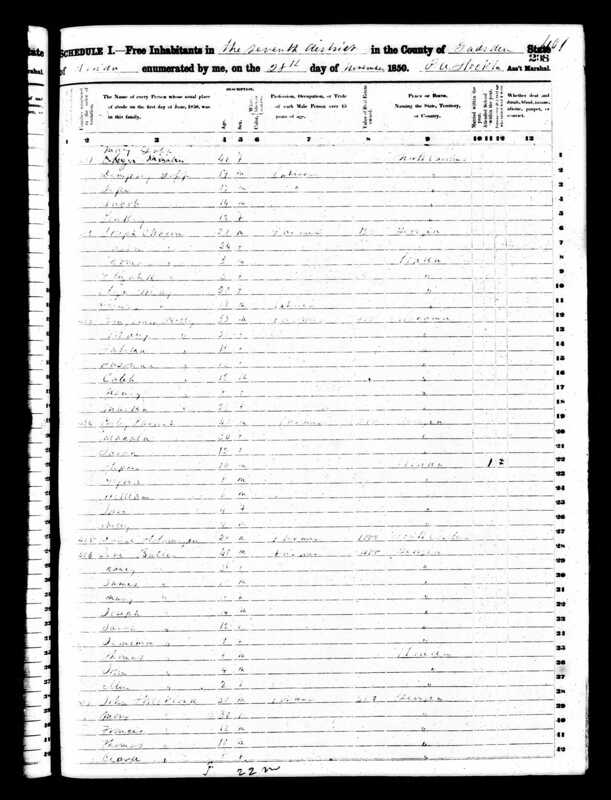 He married Georgiana Willis(1853 -1882) in on May 27,1870 in Liberty County, FL.